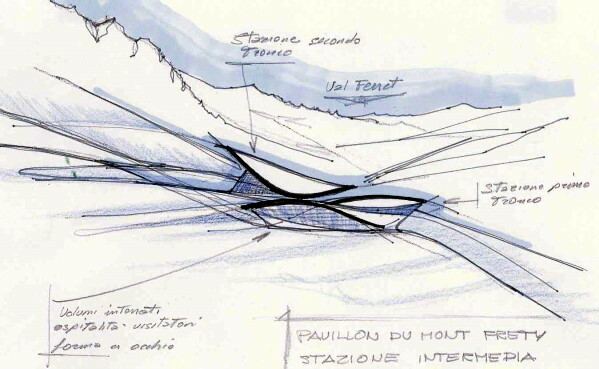 The intermediate station of the Pavilion has been conceived to fit elegantly amongst the mountainous alpine landscape of Mont Frety, consisting of two opposing slopes. The curved surface of the windbreakers at the stations, harmoniously placed side by side, embrace the areas covered to considerable heights, defined largely by the strict profile requirements of the cableway line. The structure of the upper station, required to cover the second segment’s departure platform, is over 15 metres above the ground, leaving exposed only the front part above the large groin overlooking the facilities. The alternation of curved planes reaching towards the ground makes it clear that even the underground segments play a key role, alternated by linked external surfaces that give the impression of being a mobile mechanism, with the covers following the length of the cables up to their anchor points. 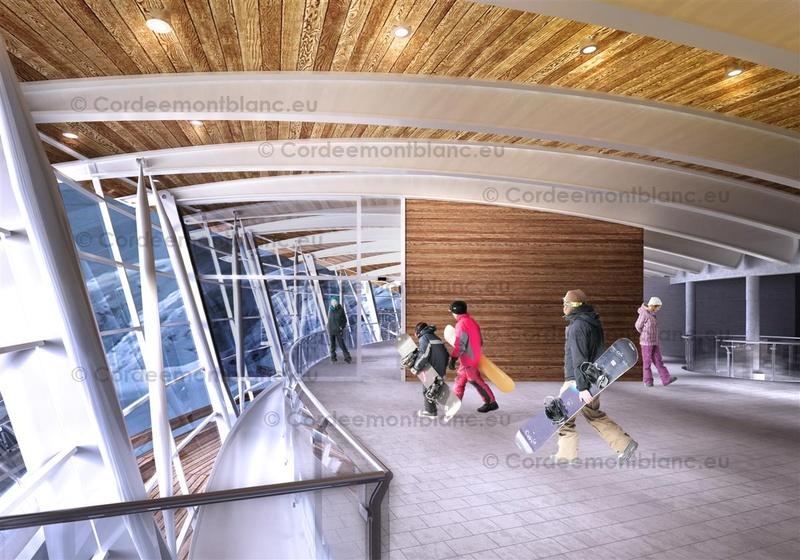 Large windowed surfaces are divided by thin, inclined structures, and are part of the areas spanning both passenger departure platforms, offering tourists a wide-open scenic view that works as backdrop on both sides, with the opposing Val Veny and Val Ferret, which highlight the incredible sensation of altitude of the Mont Blanc, which overlooks the whole surrounding landscape. 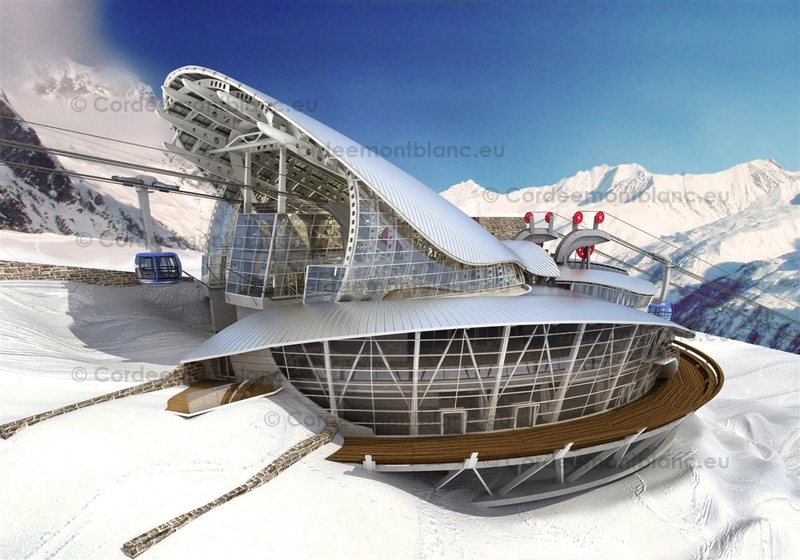 To the west, facing Mont Blanc, surrounded by a large, wing shaped cover, is the structure that houses the reception and refreshment areas for the public. The project, despite its multi-layered arrangement, is focused on meeting all tourism hosting requirements with what we can define as the tourist reception area for the whole complex. The various integrated environments are traversed by a path that passes through the shopping areas, a cinema, restaurants, cafes, and which finally reaches the old restored station that will serve as a museum. 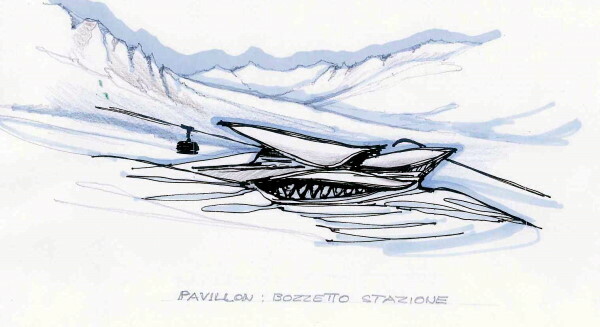 This roofed environment inside the station allows the public to easily move from one boarding platform to the other, in an area equipped with elevators and reception areas for enjoying the facilities even in the event of rough weather. This area also connects to the external terraces on both sides, and also towards the East to the current Pavillion hut.